Match Group, Inc. (NASDAQ:MTCH) has seen a decrease in activity from the world’s largest hedge funds lately. Our calculations also showed that MTCH isn’t among the 30 most popular stocks among hedge funds. However, overall hedge fund sentiment towards the stock is still near its all time high that was achieved at the end of September. In today’s marketplace there are numerous formulas investors employ to grade publicly traded companies. A duo of the less utilized formulas are hedge fund and insider trading activity. Our experts have shown that, historically, those who follow the top picks of the elite money managers can beat the S&P 500 by a significant margin (see the details here). We’re going to take a look at the fresh hedge fund action regarding Match Group, Inc. (NASDAQ:MTCH). What does the smart money think about Match Group, Inc. (NASDAQ:MTCH)? At the end of the fourth quarter, a total of 24 of the hedge funds tracked by Insider Monkey were bullish on this stock, a change of -17% from one quarter earlier. 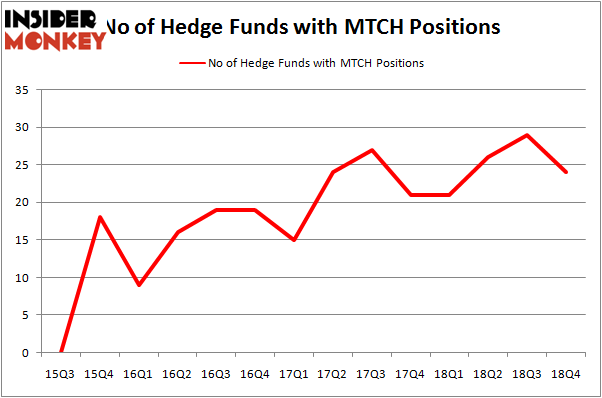 The graph below displays the number of hedge funds with bullish position in MTCH over the last 14 quarters. With hedgies’ positions undergoing their usual ebb and flow, there exists a few key hedge fund managers who were increasing their holdings significantly (or already accumulated large positions). When looking at the institutional investors followed by Insider Monkey, Cliff Asness’s AQR Capital Management has the most valuable position in Match Group, Inc. (NASDAQ:MTCH), worth close to $66.2 million, amounting to 0.1% of its total 13F portfolio. Coming in second is D E Shaw, managed by D. E. Shaw, which holds a $63.7 million position; the fund has 0.1% of its 13F portfolio invested in the stock. 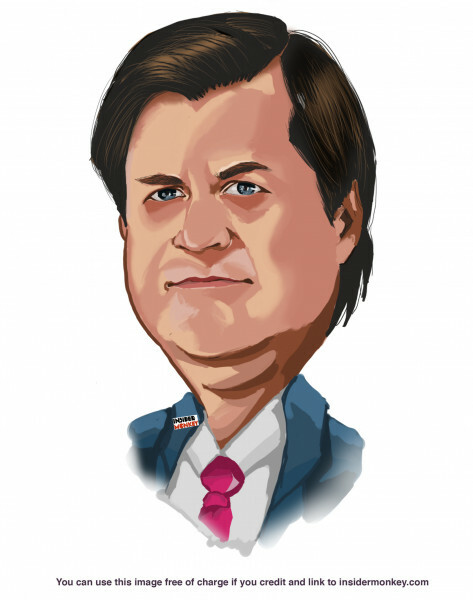 Other hedge funds and institutional investors that hold long positions contain Glen Kacher’s Light Street Capital, John Overdeck and David Siegel’s Two Sigma Advisors and Israel Englander’s Millennium Management. Due to the fact that Match Group, Inc. (NASDAQ:MTCH) has faced declining sentiment from the aggregate hedge fund industry, it’s easy to see that there were a few hedgies that decided to sell off their positions entirely in the third quarter. At the top of the heap, Alex Sacerdote’s Whale Rock Capital Management cut the largest position of the 700 funds monitored by Insider Monkey, totaling close to $154.6 million in stock. Josh Resnick’s fund, Jericho Capital Asset Management, also sold off its stock, about $106.5 million worth. These transactions are important to note, as total hedge fund interest dropped by 5 funds in the third quarter. Let’s also examine hedge fund activity in other stocks – not necessarily in the same industry as Match Group, Inc. (NASDAQ:MTCH) but similarly valued. We will take a look at Hologic, Inc. (NASDAQ:HOLX), Teleflex Incorporated (NYSE:TFX), Rollins, Inc. (NYSE:ROL), and Altice USA, Inc. (NYSE:ATUS). All of these stocks’ market caps resemble MTCH’s market cap. As you can see these stocks had an average of 29 hedge funds with bullish positions and the average amount invested in these stocks was $761 million. That figure was $296 million in MTCH’s case. Altice USA, Inc. (NYSE:ATUS) is the most popular stock in this table. On the other hand Teleflex Incorporated (NYSE:TFX) is the least popular one with only 15 bullish hedge fund positions. Match Group, Inc. (NASDAQ:MTCH) is not the least popular stock in this group but hedge fund interest is still below average. Our calculations showed that top 15 most popular stocks among hedge funds returned 19.7% through March 15th and outperformed the S&P 500 ETF (SPY) by 6.6 percentage points. Hedge funds were also right about betting on MTCH as the stock returned 28.6% and outperformed the market as well.